this beetroot rice is slightly spicy with the sweetness of beetroot coming through in the spiced rice. rinse basmati rice in water very well. then soak the rice in enough water for 20 minutes. after 20 minutes, drain the rice and keep aside. instead of basmati rice, you can even use any other fragrant rice or even regular or short grained rice. heat 2 tbsp oil in a pressure cooker. then add all the whole spices. the oil should be hot enough so that the mustard seeds crackle as soon as you add them in the oil. do keep the flame on a low to medium flame, so that the other spices do not get burnt. add 1/3 cup chopped onion and 7 to 8 curry leaves. stir and saute till the onion start to become light golden. then add 1 tsp ginger-garlic paste, 1 to 2 green chilies (slit) and ¼ cup chopped coriander leaves. saute for a few seconds till the raw aroma of ginger-garlic goes away. now add 1 cup finely chopped beetroot. do chop the beetroot finely. you can also grate beetroots and then add. stir and saute for a minute. add ¼ tsp turmeric powder, ¼ tsp red chili powder and ½ tsp coriander powder. mix and stir well. add the rice. stir gently and saute for a minute. add 1.5 to 2 cups water. depending on the type and quality of rice, you can add water. for basmati rice, you can add 1.5 to 1.75 cups of water. i added 1.5 cups water. season with salt. stir and mix. taste the water and it should have a slightly salty taste. pressure cook on a medium flame for 2 whistles or for 8 to 9 minutes. you can also cook this pulao in a pan or pot. add water accordingly. when the pressure settles down on its own, remove the lid. gently fluff the beetroot rice. garnish the pulao with 2 tbsp chopped coriander leaves. 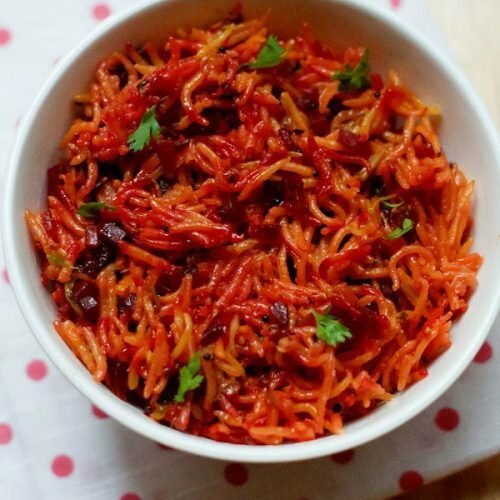 serve beetroot pulao with a side veggie salad or raita.